Pipsticks is a monthly subscription of totally awesome stickers! Currently, the company offers four different subscriptions; two for adults – Pro Club Classic and Pro Club Petite and two for kids – Kid’s Club Classic and Kid’s Club Petite. Sticker fans young and old receive 7 or 15 quality stickers and extra items. This review is of the Kid’s Club Classic, $14.95 a month, box. LIMITED TIME DEAL: Use coupon code INSTAXPRO25 to save 25% off your first month of the Pipsticks Classic subscription. Or, use coupon code INSTAXKIDS25 to save 25% off your first month of PipSticks Kid’s Club Subscription! COUPON: Use code OMG10 to save 10% off! Ships to: USA and Worldwide with an additional cost for shipping. Please see the FAQ for more details. 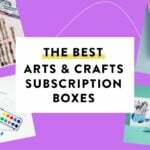 Check out all of our Pipsticks reviews and more sticker-based subscriptions in the Artisan-Paper Subscription Box Directory! Pipsticks now sends a mini magazine each month called Little Pippy. The magazine announces their coloring contest, raffle prize, contains jokes, coloring pages, mazes and sticker activity pages. Pipsticks Postcard with Postage – $2.00? The postcard used to be blank and now it comes pre-printed with a design you can color and embellish with stickers. This sheet of pastel colored animals is pretty funny. Some of them are drawn normally while others have extremely exaggerated features like stretched out elephant trunks, deer antlers, and monkey arms. I like the green kiwi bird the best with his yellow carrot shaped beak. The glittery arrows are a beautiful shade of blue. I haven’t decided what these would be good for yet, so I’ll have to hang on to these until we think of something good. Tiny cars are perfect for when my son draws maps of towns and likes to decorate the roads with vehicles. These sweet bears are amazing. My favorite is the one dressed as the witch at the bottom. Something about their large round noses and tiny eyes makes them so loveable! These autumn themed stickers are a great size to use for envelope seals. The apple-juggling owl is especially sweet. My son was very excited to see some sports themed stickers this month. The basketball hoop is perfect timing since he’s starting his rec. league next week. These pandas have a textured matte finish that reminds me of the grain of wood. They are mixed with tiny holiday ornaments and I think these will be used to decorate a special present this holiday season. These tiny leaves are perfect for decorating a planner page this month. My daughter is a big fan of owls and she claimed these right away. They have very amusing expressions from their big cartoon-like eyes. These matte stickers are a Pipsticks exclusive and are meant to be colored in. My kids liked the idea of these. Hopefully, they’ll send more of this type in the future. I love these little dog faces, especially the ones wearing kerchiefs around their necks. My kids always look forward to the scented stickers each month. These had a sweet and spicy cookie smell. I never knew a sticker of a skunk could make me so happy. I think more stickers should be cute skunks. The other animals are darling as well. A whole sheet of fun mini puffy animals is sure to please, but even more so when they have musical instruments and bow ties! The sheep playing maracas is my top choice. These rocket stickers are awesome. I like the patriotic American flag details as well. Verdict: Our family really loves the Pipsticks Kids Club Classic! We always think they have a wide variety of sticker designs and styles. The value was certainly there as this pack cost $14.95 (free shipping) and I’ve frequently seen full sheets of stickers sell for $2-$3 each. One thing we really miss though is the colored sheets of paper they used to send. This is such a fun subscription for sticker lovers of all ages; I highly recommend it. What do you think of Pipsticks? How do subscribers rate Pipsticks? Do you subscribe to Pipsticks? Add your rating now!